The singer shared her one-month-old twins with the world via Instagram for the first time late last week, uploading the most Beyonce photo in the history of Beyonce photos (above). 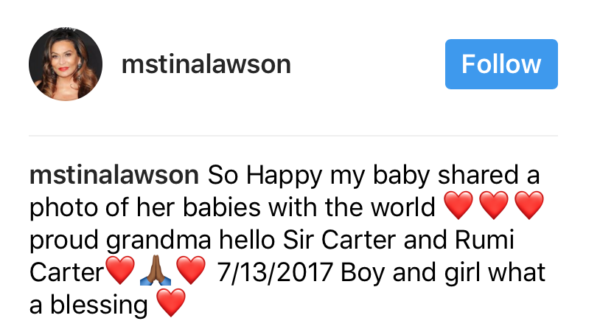 Then, Beyonce’s mum Tina confirmed the twins – a boy and a girl – are named Sir Carter and Rumi Carter on the weekend, answering the “wait, what? Is one baby called Sir Carter Carter? What is Rumi’s surname?” ponderings of many confused followers around the globe. As Beyonce’s twin debut pic went wildly viral, some parents were already hatching cheeky plans. In fact, it took approximately 99 problems seconds for people to begin responding with their own very, very funny pictures, and like Beyonce’s, they illustrate that the juggle is very, very real with it comes to multiple kiddos. Granted Bey’s pic is a little more floral, puffy-panted and fancy than her pretenders’, but there’s common ground when it comes to a) having hands full and b) still being alive. Parents appeared delighted by the challenge Beyonce threw out, donning veils, Speedos, Peppa Pig capes and fluffy slippers in their quest to match the singer’s look. Scroll through for a giggle – and to instantly feel better about life in the parenting trenches. It’s not all floral backdrops and fetching veils. What. A. Relief! The likeness is uncanny …..